I own a couple of neat old medical books. One was published in 1935 and is entitled The Canadian Formulary. It's essentially a cookbook for pharmacists, particularly ones who plied their trade at the military hospital in Kingston, Ontario (there's a stamp on the inside cover). The book contains some interesting recipes, to say the least, which is what you get when your ingredient list includes arsenic, lead, mercury, strychnine, and chloroform. 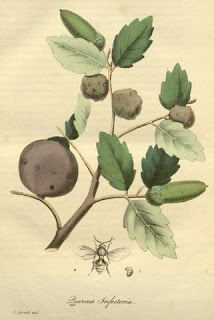 One recipe in particular that recently caught my eye was for an "Ointment of Galls with Opium". Now, opium is totally something I would expect to find in an old medicine book. It's a sticky brown substance obtained by carving up the immature seed pods of opium poppy plants. This causes them to bleed latex (containing the painkillers codeine and morphine) that then dries out like blood from an old black fly bite behind your ear. Scrape this gunk off, you've got opium. Up until the latter part of last century, opium was added to all sorts of medicines including the classic laudanum and the awesomely named Kendal Black Drop (Coleridge was a fan). But galls? What the heck? Well, as it says in the book: "Galls are the excrescences on Quercus infectoria resulting from the deposition of the eggs of Cynips gallae tinctoria". Lots of fancy words there. Let's back it up for a second. A more general definition of a gall is a bump somewhere on the surface of an organism that is formed by the abnormal yet localized growth of its tissues. It's akin to a wart or benign tumour. In plants, galls can be found all over the place, including on roots, trunks, branches, buds, leaves, flowers, and fruits. They are caused by the actions of other organisms capable of infecting the plant and manipulating it to form a beneficial structure for their use. For example, mites and insects will induce and use plant galls as a nursery, castle, and/or buffet. Galls can be coaxed to specifically develop from tissues with high concentrations of nutritious soluble sugars and amino acids. Other organisms capable of making plant galls include fungi, bacteria (e.g. crown galls are caused by Agrobacterium tumefaciens, which we use in biotech to introduce new genes into plants to make GMOs), viruses, nematodes (often form root galls), and other plants (e.g. mistletoe). The most visible galls are usually those present on the trunks of trees (at or near eye level), although the orange slimy tentacled galls formed by Gymnosporangium fungi infecting the branches of cedar trees are pretty darn noticeable as well. Oak galls, also known as oak apples (since they are relatively large, round, and form on branches), develop when adult female wasps (often belonging to the genus Cynips) lay their eggs inside the branches and buds of oak trees (genus Quercus). These galls have been harvested for human use since ancient times. For example, thousands of galls were found along the main street of ancient Herculaneum, a city buried (and preserved) by the eruption of Mt. Vesuvius in 79 CE. They are thought to have been from a container located outside of one of the shops that lined the street. The human uses for oak galls largely stem (heh) from their high concentration of tannins. Tannins are polyphenolic molecules produced by plants that have brown colour (think steeped tea) when dissolved in water. Consequently, galls can be ground up and mixed with various things to make inks and dyes (e.g. to give wool an ivory to light brownish yellow colour). They also have been used for tanning and as medicines (more about that later). A cool potential future application for oak galls is cleaning up aquatic environments contaminated with mercury, as gall powder has been shown to be pretty good at removing this metal from water. Galls resembling those made by Cynipini wasps (a group that includes Cynips) have been found on the leaves of fossilized oak leaves dating back 30 million years, indicating that the whole oak-wasp thing has been going on for a while now. What's really neat is that each oak species will typically be infected by a distinct and specific set of Cynips species, reflecting their attraction to the particular chemical makeup of different oaks. One notable gall-generating oak-wasp interaction occurs between Quercus infectoria (gall oak) and Cynips gallae tinctoria (gall wasp). Quercus infectoria is found in the eastern part of the Mediterranean, grows best in moist soil away from full sun, and produces weirdly long and narrow acorns. Wasp-induced galls found on this tree are sufficiently dense that they'll sink in water, smell faintly of something gone terribly rotten, are prized for their very high tannin content. Getting back to our "Ointment of Galls with Opium", Quercus infectoria galls are one of the more popular traditional medicines in Asia, particularly in India and Malaysia. There's a big list of medically useful things that these galls seem to be able to do, at least based on laboratory investigations. These include reducing blood sugar, inhibiting inflammation, promoting wound healing, and killing all sorts of disease-causing microorganisms. In particular, gall extracts have antibacterial activity, which may be mediated by the tannins. In keeping with their ability to kill bacteria, the galls of Quercus infectoria have long been used in India to treat gum disease, dysentery, gonorrhea, impetigo, tonsillitis, and chronic diarrhea. Gall extracts are also capable of killing the larvae of Culex pipiens, a common mosquito found all over the world, including in the London Underground and in the sewers of NYC. Abrahamson WG, Hunter MD, Melika G, Price PW. 2003. Cynipid gall-wasp communities correlate with oak chemistry. Journal of Chemical Ecology 29(1):209-223. Canadian Pharmaceutical Association. 1935. The Canadian Formulary. University of Toronto Press. Latifi AM, Nabavi SM, Mirzaei M, Tavalaei M, Ghafurian H, Hellio C, Nabavi SF. 2012. Bioremediation of toxic metals mercury and cesium using three types of biosorbent: bacterial exopolymer, gall nut, and oak fruit particles. Toxicological & Environmental Chemistry 94(9):1670-1677. Larew HG. 1987. Oak galls preserved by the eruption of Mount Vesuvius in AD 79, and their probable use. Economic Botany 41(1):33-40. Leckey EH, Smith DM. 2015. Host fidelity over geologic time: Restricted use of oaks by oak gallwasps. Journal of Paleontology 89(2):236-244. Redwane A, Lazrek HB, Bouallam S, Markouk M, Amarouch H, Jana M. 2002. Larvicidal activity of extracts from Quercus lusitania var. infectoria galls (Oliv.). Journal of Ethnopharmacology 79(2):261-263. Shahid M, Ahmad A, Yusuf M, Khan MI, Khan SA, Manzoor N, Mohammad F. 2012. Dyeing, fastness and antimicrobial properties of woolen yarns dyed with gallnut (Quercus infectoria Oliv.) extract. Dyes and Pigments 95(1):53-61.